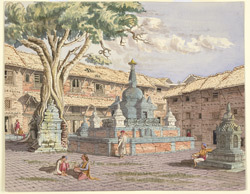 Watercolour of a Buddhist temple within one of the squares at Kathmandu in Nepal, by Henry Ambrose Oldfield (1822-1871), dated November 1852. The image is inscribed on the reverse: 'Buddhist Temple in the Square called 'Lughura Tow Vihar', Kathmandoo. November 1852'. Dr Oldfield, who was Residency Surgeon at Kathmandu from 1850-1863, wrote in 'Sketches from Nipal, Historical and Descriptive...' (1880), "[vihars] are double-storied and usually built in the form of a quadrangle. In the centre of this quadrangle there is always one chaitya [prayer-hall], and in some vihars there are several. On the north side of this central chaitya, opposite the shrine of Amoghasiddha, is a small tank or basin...There is also always a shrine containing a figure of Sakya Singha in the quadrangle, and a pair of reliefs of Ganesha and Mahenkal at the entrance of every vihar..."